We were so sad to learn that the vintage space-saving, small high chair at the Bramble Berry House broke (insert sad face here). This is the new one we replaced it with. It’s not as kitschy cool as the old one (sigh) but it does the trick of folding up and storing completely flat. 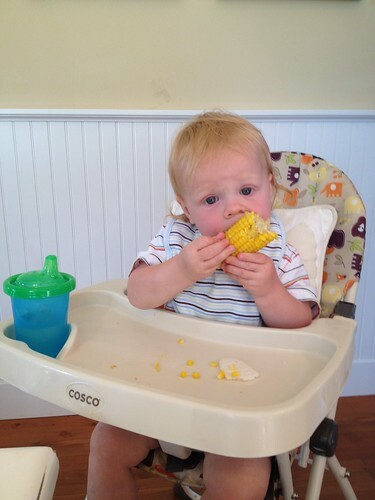 Jamisen is loving some Seabrook corn (thank you Market for keeping grocery prices affordable!). We also left a sippy cup in the cupboard for anyone that shows up without one. We have been there, done that and can sympathize. 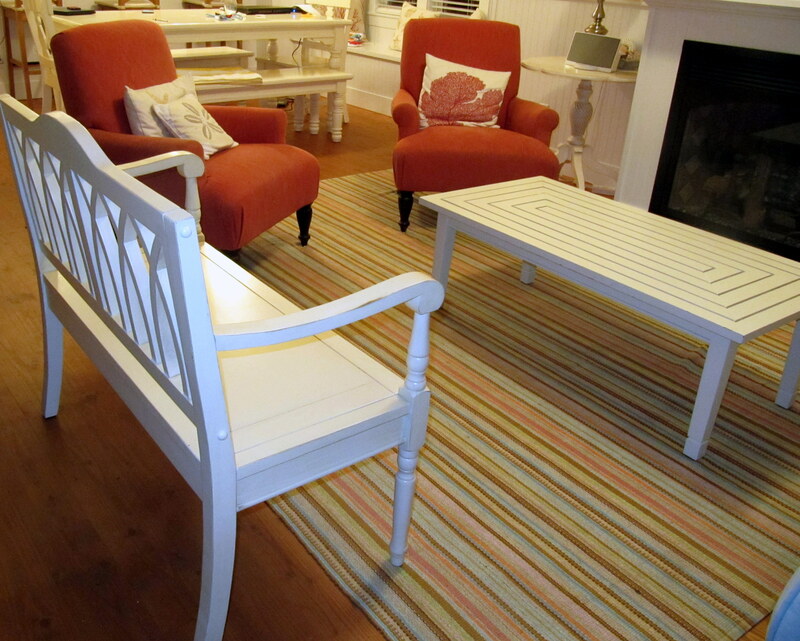 We added some extra accent pieces to the house – just to give a bit more comfort (especially to our lovely window seat). 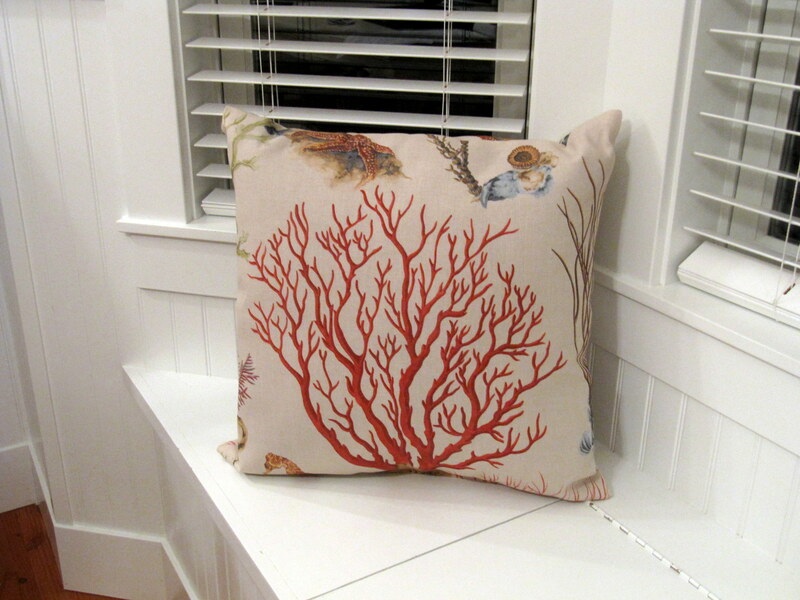 We love the look of the sea-inspired pillows and think they work beautifully in the house. 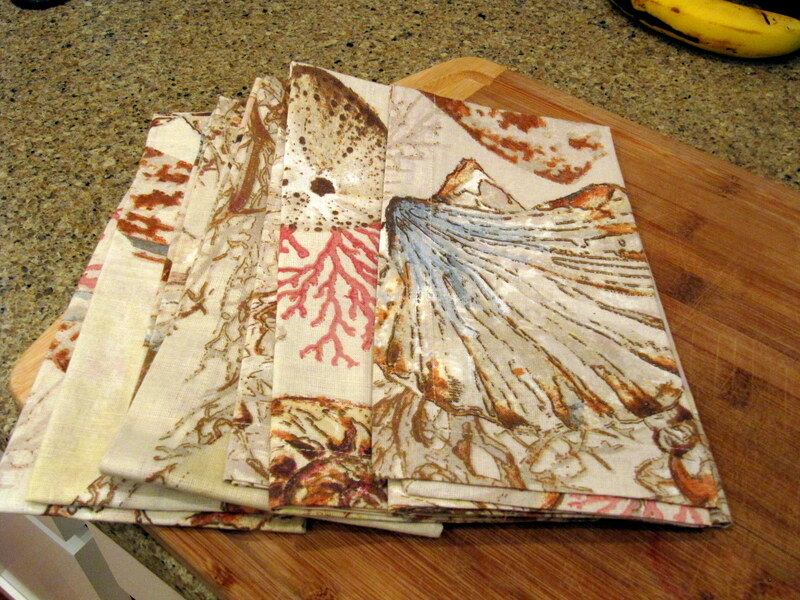 We also got new napkins for the table. 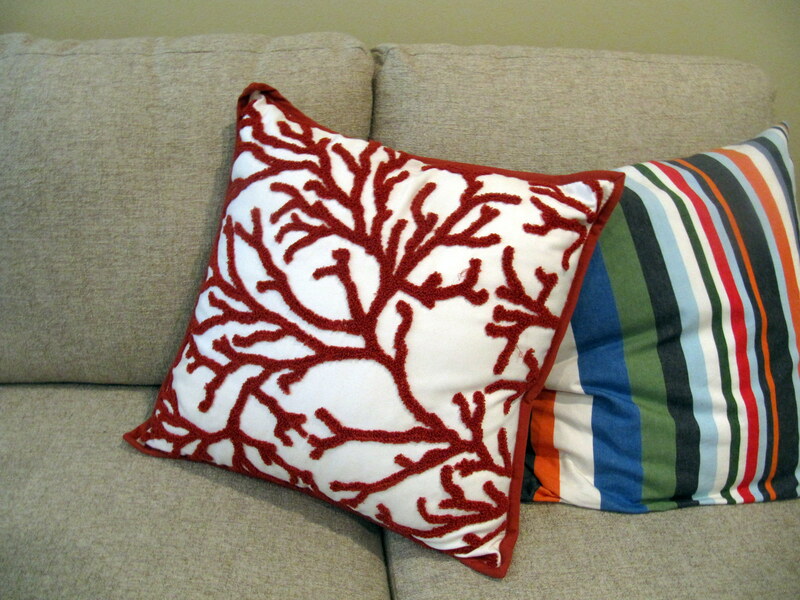 They match the pillow from Pottery Barn to help make the house look more connected from room to room. We hope these extras make the home more comfortable and more destination-themed for all of our visitors. Thanks to a great suggestion in the guest book (yes, we read all those comments and love to hear how your visits went! 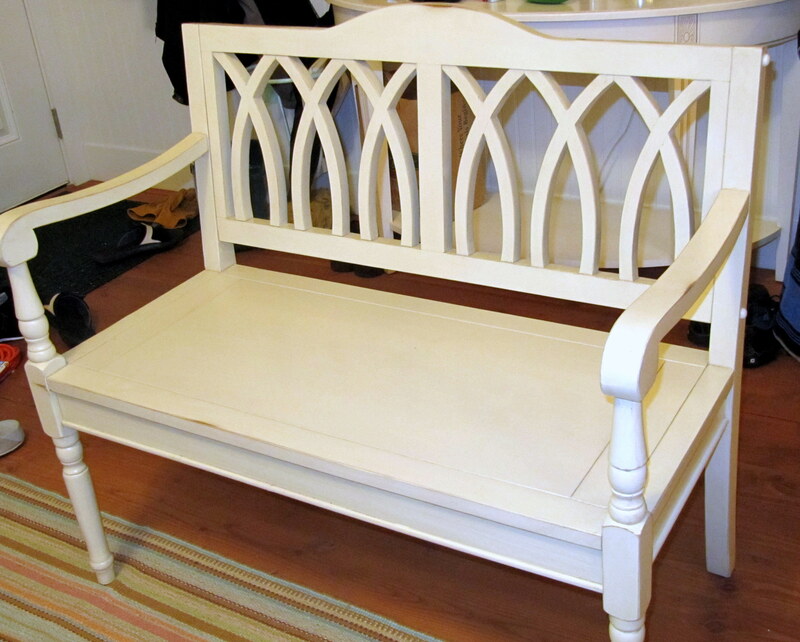 ), we added a bench to the living room. This way, the living room can fit even more people in it. We’re hoping it doesn’t take away from the open feeling of the top floor house design. 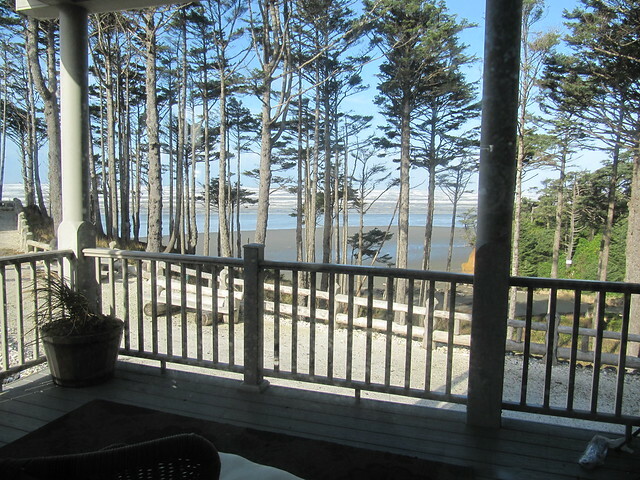 When we were last at The Bramble Berry House at Seabrook, we used the outdoor shower (with a toddler who loved the beach, it was so convenient to clean up outside). One thing we noticed is that the shower did not drain as well as it could. Thanks to one creative and hardworking husband, that issue should is now solved. He installed a drainage pipe under the shower that should drain cleanly and quickly for years. 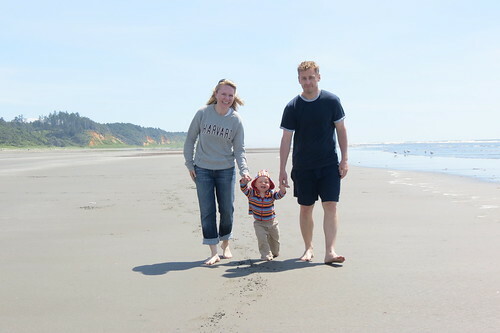 Our family snuck away for a little Seabrook beach time recently. Both Chris and I worked during Jamisen’s nap time (he’s thankfully still taking 2 naps a day) and when he wasn’t napping, we were happily exploring the great outdoors. We literally spent every moment possible outside during the sunny days that we had. 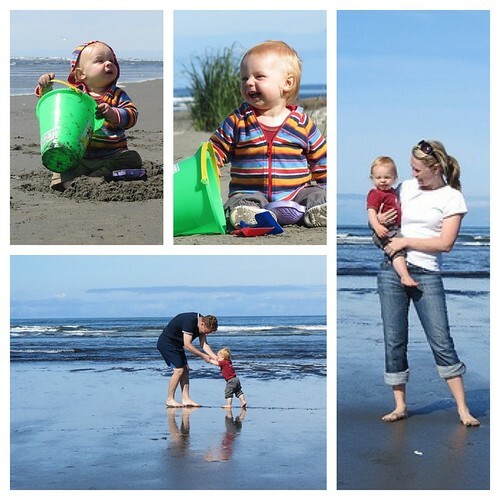 Though Jamisen has been to the beach before, he wasn’t really mobile so this was his first real introduction to sand. Jamisen initially wasn’t a fan of the sand. He would lift his feet, and try not to have to touch it. And then, Grandpa gave him tools. That was all it took for Jamisen to become a big fan of sun, surf and sand. He liked it so much that he kept trying to eat it. 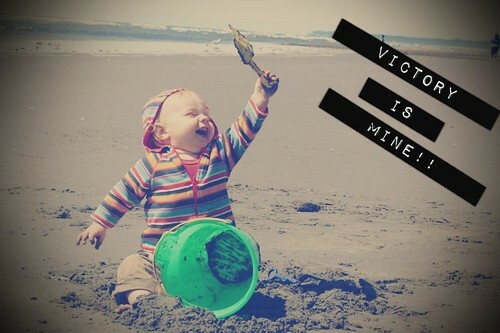 We’re hoping he grows out of this eating-sand phase. 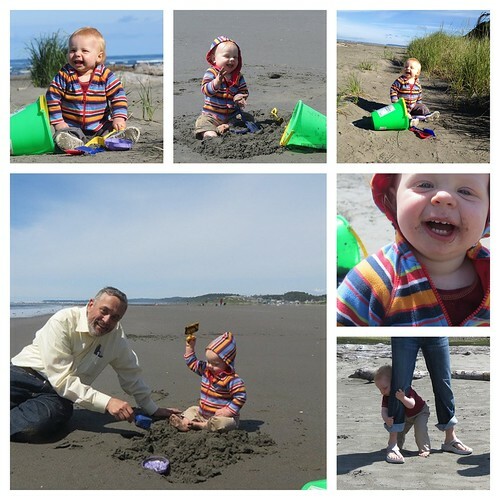 Grandpa got completely soaked and dirty showing Jamisen the finer points of shoveling sand (don’t laugh; it’s an art). Grandpa also dropped his iPhone in the ocean. We all held our breath for two hours until he had dried it out (by baking it). His iPhone appears no worse for the wear except that it won’t ever power off. Phew! Jamisen is learning how to walk. He takes a few steps on his own but hasn’t quite gotten the hang of it. He looks like he’s doing a great job right? Ha! 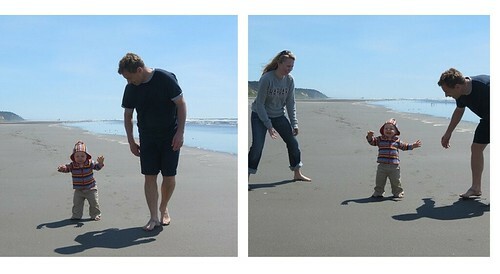 And just out of frame, both parents are at the ready to catch him if he takes a tumble. Chris and I are both thankful for time off as a family. We both agree that taking time off with a one year old is tons of fun but not very relaxing. We were so excited that the Bramble Berry House is so close to the one big play area at Seabrook because we utilized it a lot too. 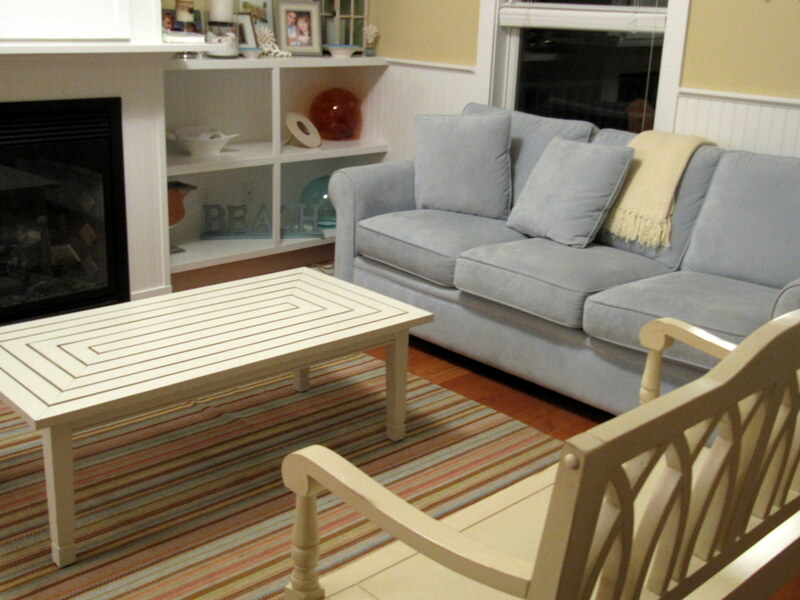 Between the beach, the pool and the playground, Seabrook is perfect for families, ours included. 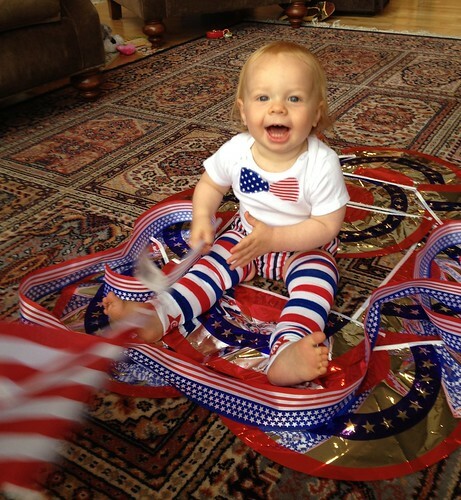 Seabrook had a wonderful celebration for Independence Day. See the full photo list here. 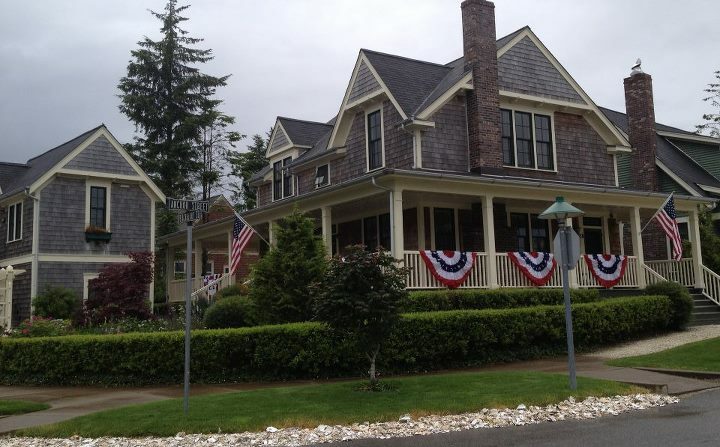 The lovely Bramble Berry House was rented over the holiday so we enjoyed the fireworks in Bellingham, WA but we did make it down a couple days before to see the entire town decked out in festive red, white and blue. 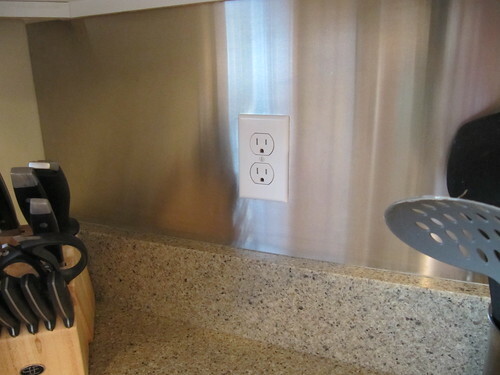 We added a new stainless steel backsplash to the kitchen at the Bramble Berry House. 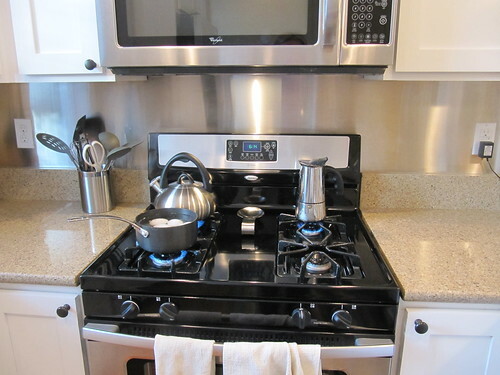 It really helps to make the kitchen look crisp and clean while preventing unsightly splash marks from the stove. It adds light to the entire kitchen since the backslash reflects and refracts light. Our Seabrook home is getting use as a vacation rental and now, our kitchen is even more ready for visitors. We were so delighted when our friend Bob Ridgely, a successful producer and filmmaker, mentioned to us that he was going to come to Seabrook to film some chocolatiers for a documentary on bean-to-bar chocolate producers. 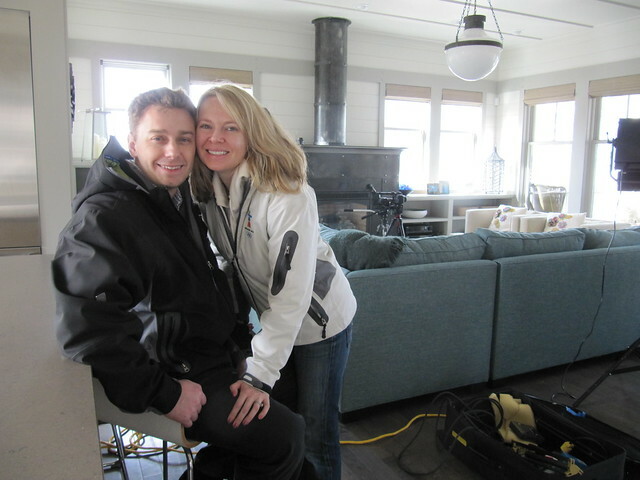 The perfect place to shoot the interviews was, of course, the Coastal Living Home. 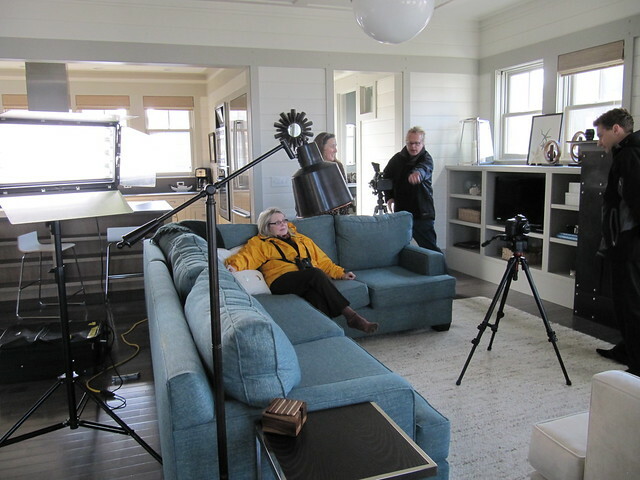 Set up was easy because the living room has so much beautiful natural light and a gorgeous living room area. We can’t wait to see Bob’s film. And we’re not just saying that because he brought us some bean-to-bar chocolate. One of the things that we love about the Bramble Berry House at Seabrook is that there are books to read for a rainy day. The books for teens and adults are typically in the living room, in a basket. 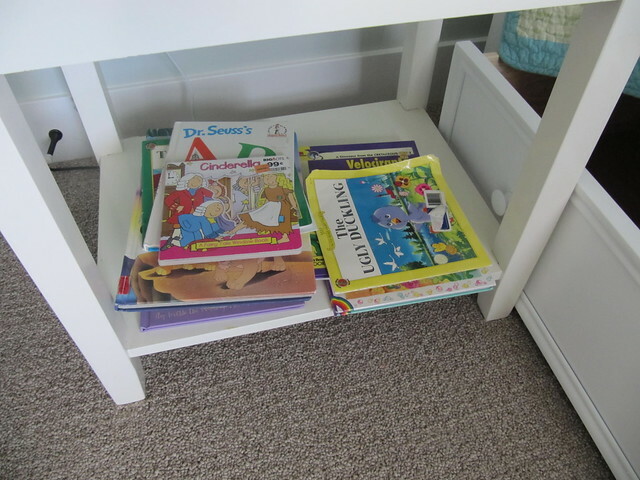 But the kids’ books are often hidden away. 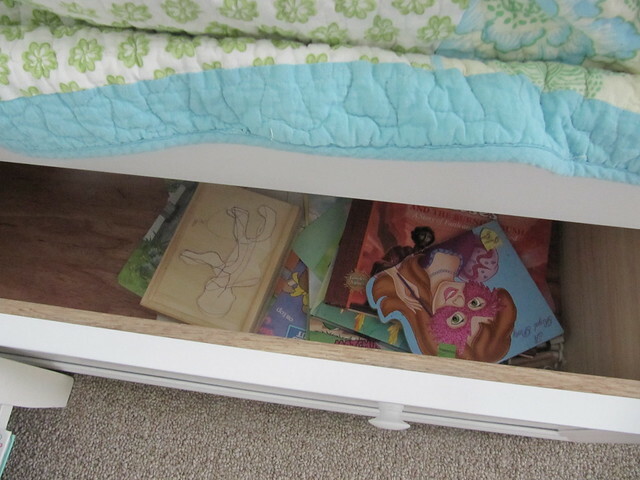 Don’t be afraid to open up the drawers in search of books for your little ones. If the attic race track doesn’t keep them busy, between the books, the games downstairs, the Wii and the pool, even a little bit of rain won’t phase the kiddos.